This time we broke a record and created a Child:Volunteer ratio of 3:1 :)) - Thanks to the efforts of the amazing IBM team from Noida! They made the collection drive as well as this toy library possible, all within the span of a month. I realized today that when we complain about not having time to do anything good, we actually waste ourselves away. Normally, on any other given weekend, I spend time with my family and friends ... ... However, something invaluable happened this Saturday! Geetanjali JainIt wasn't just a regular Saturday this time, it was a special one as we got a chance to do make others feel special. It takes a lot of effort to bring a smile on to a persons face and I am glad I was able to do that by playing with the little angels. It was an overwhelming experience which lead to purity of heart and a feeling that devoting a little time of your life can make others happy.Thanks to you for organizing it , I look forward to more of such activities. 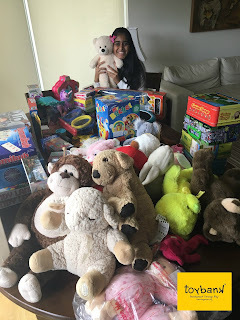 Even as I agreed to engage with the Toybank and volunteer for the event, I had no idea that it would be such a fantastic experience. It just seemed to be an “accident” waiting to happen. It came as complete surprise to me when I found out during the sessions that not only were the children very enthusiastic and intelligent, but also very well behaved. I came back with a feeling of having gained something valuable from the experience of interacting with kids. Plus the event was very well organized and I have only words of praise for the organizers. It was wonderful to meet the other volunteers as well. In future, I would love to continue associating with similar events. I did clay modelling with the first batch of girls. Both of them loved the experience of creating something colourful. However with the given resources, we had just one brush to paint. I was quite happy to see that both the girls shared the responsibility of painting one at a time instead of fighting over the paint brush. The outcome was two wonderfully carved clay models: A Butterfly and A Mushroom. With the 2nd batch, I play lego blocks with 3 boys and 1 girl. All the kids had fair understanding of what a screw, nut, bolt and a player was. Based on a blue print, we created a hovercraft and a crane. Although some of the blocks were missing, we did have some spare time to create a windmill out of the rest of the blocks. The kids were very happy to see it turn. Overall, the kids were well behaved and were able to use the toys to their benefit. Hope to visit them soon. It was a great experience to be a part of this drive. We really enjoyed a lot and felt satisfied sharing a few hours with the extraordinary kids of Literacy India. I, personally, would like to be a part of these kind of drive in future and really thank you for taking these kind of initiatives. It was a great experience being with such enthusiastic kids. 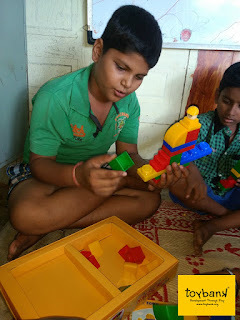 I am sure it was a learning experience for the kids.. moreover it was learning experience for me personally to be know and play with the kids … understand that with such small things we can bring a smile to them. It was really nice to see the Literacy mission educating the kids and I must say some of them were really intelligent with great potential. To view snapshots of the this event click here.